Democrats won their Senate races in Connecticut and West Virginia. Blanche Lincoln in Arkansas and Brad Ellsworth in Indiana lost. 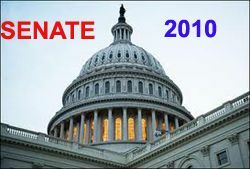 Republicans need to gain 10 Senate seats to take control. I don't think they'll do it. Update: Marco Rubio wins the Florida Senate seat.